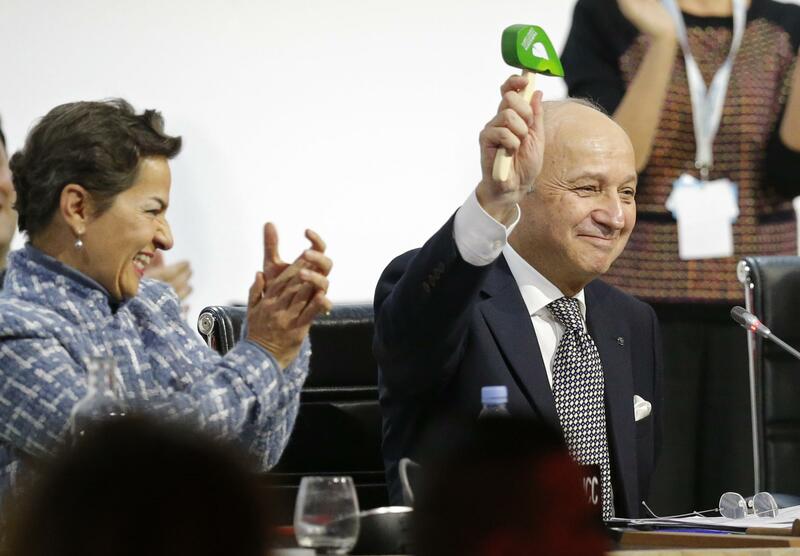 On Saturday, after nearly two weeks of fraught negotiations in Paris, the French Foreign Minister Laurent Fabius -- who presided over the climate talks -- brought down a green leaf-shaped gavel, sealing a deal that many hope would mark a turning point in the fight to curb global warming. “It may be a small gavel but it can do big things,” Fabius reportedly said, as a room filled with journalists and delegates from nearly 200 countries erupted into cheers and applause. The pact, for the first time in history, commits almost all countries to reduce greenhouse gas emissions -- a significant departure from the Kyoto Protocol of 1997, which set emission reduction targets for only a handful of developed countries. It calls for “holding the increase in the global average temperature to well below 2 degrees Celsius above preindustrial levels.” Additionally, it also urges countries to pursue efforts to limit the temperature rise to the much more ambitious 1.5 degree Celsius -- acknowledging the concerns of low-lying Pacific island nations that will face an existential threat by a warming of anything over 1.5 degrees Celsius (2.7 degrees Fahrenheit). In order to achieve the long-term temperature goal, countries are urged to “to reach global peaking of greenhouse gas emissions as soon as possible, recognizing that peaking will take longer for developing country Parties.” Current scientific consensus is that in order to achieve this goal, the world needs to stop emitting greenhouse gases altogether in the next half-century, by achieving a balance between anthropogenic emissions and absorption by natural “greenhouse sinks” such as forests and oceans. After this has been achieved, countries would have to undertake rapid reduction in emissions. 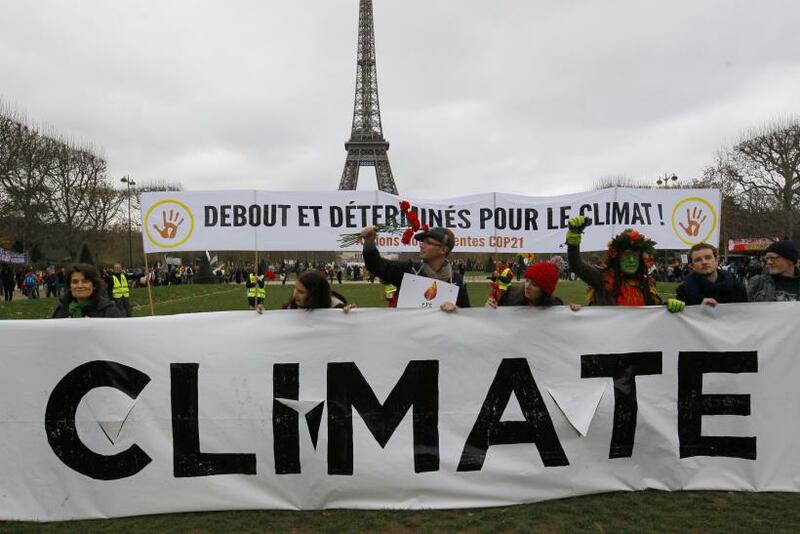 While the pact recognizes the Intended Nationally Defined Contributions (INDCs) submitted by over 180 countries prior to the conference, these pledges -- which are not sufficient to prevent a 2 degree Celsius rise in global temperatures -- are not legally binding. 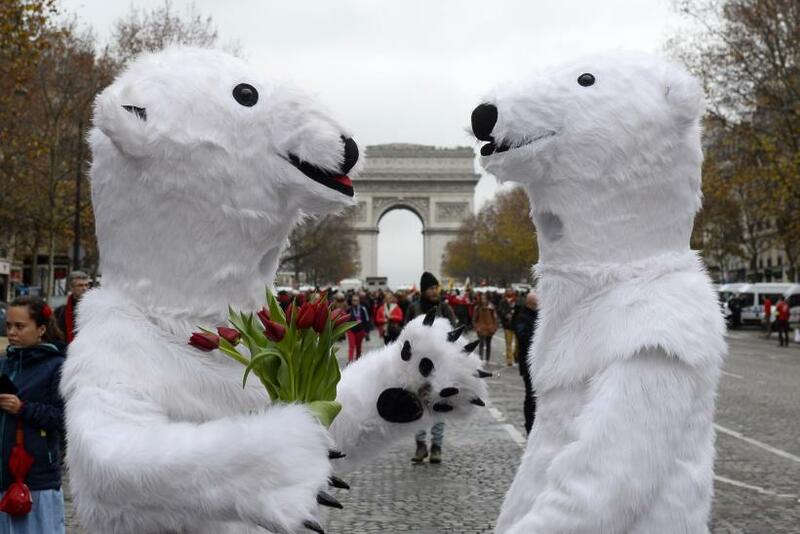 The pact, however, puts in place a review mechanism -- a “global stocktake” -- to ramp up the INDCs every five years.“The Conference of the Parties serving as the meeting of the Parties to the Paris Agreement shall undertake its first global stocktake in 2023 and every five years thereafter,” the text promises. 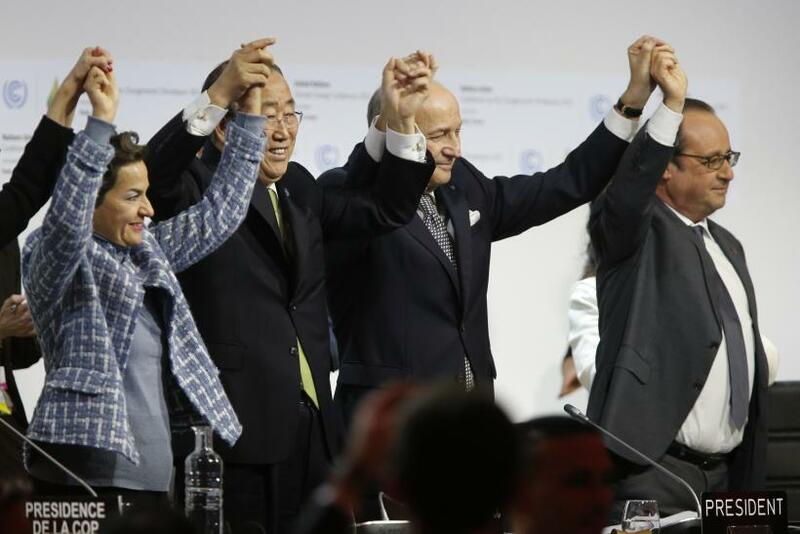 “The outcome of the global stocktake shall inform Parties in updating and enhancing, in a nationally determined manner, their actions and support in accordance with the relevant provisions of this Agreement, as well as in enhancing international cooperation for climate action.” While the agreement legally requires countries to come back every five years with new reduction targets, it imposes no sanctions on those who fail to follow through their pledges. The agreement calls on rich countries to engage in “absolute” reductions in emissions, and developing ones to “continue enhancing their mitigation efforts” -- a language that essential to placate countries like India, which have been pushing for “common but differentiated responsibilities” in tackling climate change. The pact also includes the term “loss and damage” in its text, marking the first time the phrase has been used in an international agreement. This meets a key demand of small island nations that are being impacted the most by climate change. “Parties recognize the importance of averting, minimizing and addressing loss and damage associated with the adverse effects of climate change, including extreme weather events and slow onset events,” the text reads. However, it also explicitly states that this provision “does not involve or provide a basis for any liability or compensation” -- a point that wealthy nations that do not want to be held financially liable for climate change-induced disasters insisted on. The agreement calls on nations to establish a “collective quantified goal” of at least $100 billion a year in climate finance by 2020. It also requires rich nations to maintain a $100 billion a year funding pledge beyond 2020, and to use that figure as a “floor” for further support prior to 2025. However, this number -- which many developing nations insist would not be enough to adapt to and mitigate the effects of climate change-related disasters -- is not legally binding.